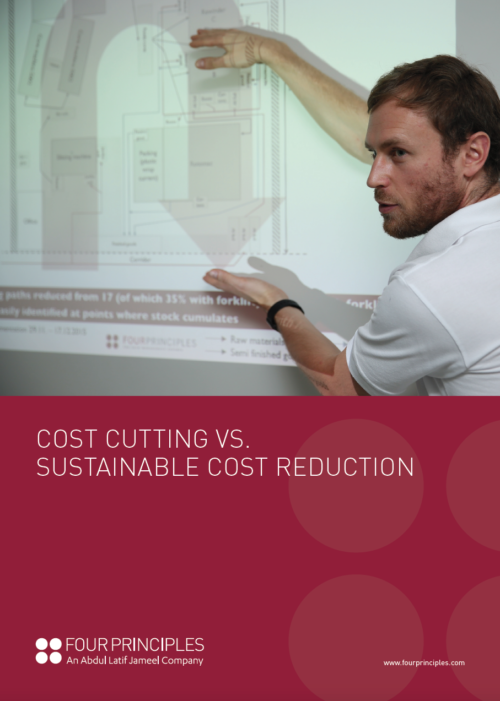 Initially, many clients confuse sustainable cost reduction with cost cutting. In reality, they could not be more diametrically opposed. The key differentiator is the word “sustainable”. In a crisis, cost cutting offers only short term relief, whereas sustainable cost reduction addresses systemic issues, eliminating waste to establish a solid platform for gradual, long term growth and profitability. At Four Principles, our first priority is identify and eliminate waste from the biggest cost drivers. Waste is defined as any product, activity or resource that does not add value from the customer’s perspective. However, given the complex and highly evolved ecosystems of most organisations, it is not always easy to identify wastes, added to which, the biggest cost drivers may not be readily apparent and measurable. Only by thorough assessment of the organisation can the value it offers a customer be defined – once this has been established, so too can areas of waste be isolated and quantified. The key to sustainable cost reduction is using this information to systematically eliminate all identified wastes from the biggest cost drivers. In so doing, an organisation is able to divest itself of its financial “excess baggage”, streamlining its operations and eliminating the headwinds of unnecessary costs. In this way, Lean changes not only working practices, but embarks the entire workforce on a journey of continuous improvement towards long term profitability. Whilst it brings tangible benefits in the short term through the elimination of waste, the most compelling rewards of sustainable cost reduction continue long into the future.